Accuweigh’s Brisbane branch recently installed a single deck weighbridge at Cheetham Salt’s Bajool plant in central Queensland. Extensive foundations work in the form of a floating raft was required to eliminate excessive movements of the single deck weighbridge on the highly unstable soils. To cope with the extremely salty environment, the single deck weighbridge was fitted with IP68 rated Avery T302 stainless steel weighbridge load cells for maximum protection in the salty environment. The metal framework of the weighbridge was also fully galvanized before being coated by a bitumen coating on site. 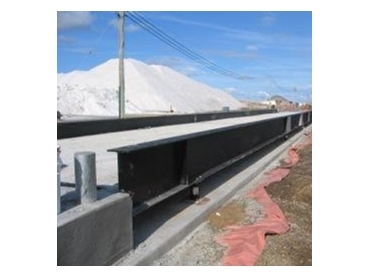 The weighbridge has a single deck 26 metres long by 3 metres wide with a weighing capacity of 60,000 kg by 20kg divisions. Accuweigh’s very flexible Ticket Aid Pro+ weighbridge software was supplied pre-configured on a PC along with a weighbridge ticket printer to perform all the necessary weighbridge tracking functions for vehicles and products. Accuweigh is an Australian industrial weighing company and has branches in all mainland states providing Australia wide after sales service and support for weighbridges, scales and all weighing equipment.